Pseudobiceros fulgor. Here in Wakatobi, S. Sulawesi, Indo. 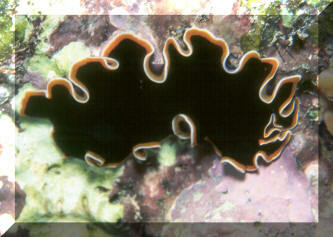 The Nudibranch Discodoris boholiensis is a Batesian mimic of Pseudobiceros fulgor looking like an unpalatable flatworm to avoid predation. 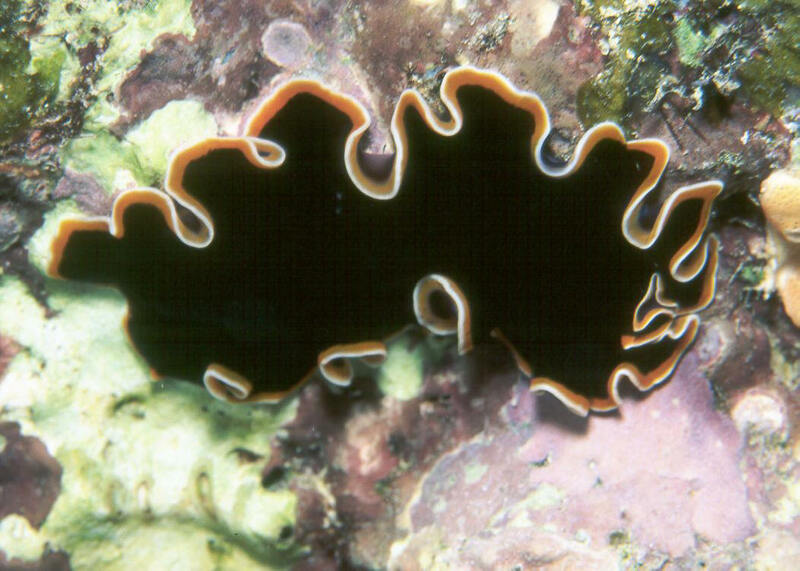 Pseudobiceros gloriosus Newman & Cannon 1994. Black velvet bodied with three marginal bands, outer dark burgundy. Melanesia, Australia, Fiji. N. Sulawesi image. Pseudobiceros hancockanus (Collingwood 1876). Highly undulated body margin with white and orange bands. To six inches in length. Indo-Pacific; Maldives to Fiji, Australia, Japan. Here off Heron Island, QLD, Australia.